Scientists from the Universities of Bristol, Cardiff, and Southampton have used a Climate Model to simulate and explore the climate of the world of Game of Thrones. The wind speeds and directions predicted by the climate model explain phenomena such as the dominance of the seas by the Iron Fleet, the likely attack plans of invading dragon hordes from Essos, and the trading routes between Westeros and the Free cities across the Narrow Sea. The temperatures predicted by the climate model indicate the likely hibernation zones of White Walkers in summer. The full results are published in a mock journal article - written by Samwell Tarly. 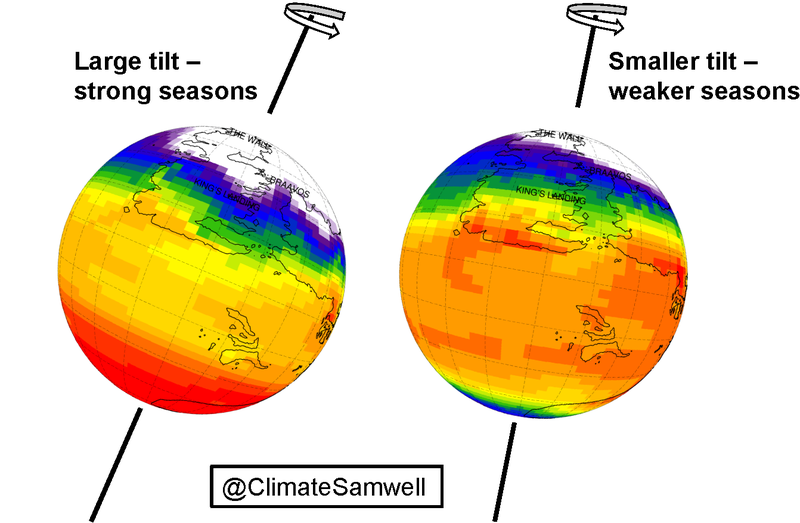 Samwell shows that the extended seasons can be explained by a ‘tumbling’ of the tilt of the spinning axis of the planet as it orbits the Sun, in such a way that that the same Hemisphere always tilts towards the Sun. He also models the global warming that would occur if concentrations of greenhouse gases in the atmosphere were to be doubled (due to increases in carbon dioxideand methane emissions from dragons and the excessive use of wildfire). His estimate of 2.1oC global warming for a doubling of carbon dioxide (the “Climate Sensitivity” of the world of game of Thrones) is within the range predicted by the Intergovernmental Panel on Climate Change for the ‘real’ Earth, of 1.5 to 4.5 oC. Professor Carrie Lear from Cardiff University added: “This work is a bit of fun, but it does have a serious side. Climate models simulate real physical processes which operate in both cooling and warming climates. Scientists working on the SWEET project are using exciting novel techniques to reconstruct the climate of super-warm states of Earth’s past. They are using this information to test state-of-the-art climate models under conditions of high atmospheric carbon dioxide concentrations, similar to those expected by the end of this century. Professor Gavin Foster, from the University of Southampton, said: “The Intergovernmental Panel on Climate Change have shown that climate models can successfully simulate climates from the freezing world of the last Ice Age, to the intense warmth of the ‘Eocene greenhouse’, 50 million years ago. These same models are then used to simulate the future climate of our planet.